In order for ANY student to ride, we require long pants and closed-toed shoes. NO STUDENT will be allowed to ride in shorts, skirts, or any unprotective shoe. We are happy to let students borrow our helmets for their first session riding with us, but by their second session, all students should purchase their own helmet. All students must wear proper riding shoes (appropriate to the discipline, i.e. English or Western; 1" heel; and smooth sole). English riders should wear half chaps or tall boots to protect their legs. Riders should dress for the weather, as we ride year round. For instance, gloves and warm outdoor pants are necessary in the winter. Stockdale's in Hixson has about as good a selection of boots and riding apparel as any in our area. It's mostly Western styled, but the selection of helmets is pretty good and there are some English riding options. Tractor Supply Company carries a few helmet styles and some Western riding boots. The Boot Barn in the Hamilton Place area will carry a nice variety of mostly Western riding boots and western apparel. Elliott's in Cleveland carries a variety of Western riding boots. We have a Rider Apparel Exchange program down at the barn! This is a great place to exchange, buy, or donate your good, clean, used riding clothing and shoes. All items, unless otherwise marked, are $10 or can be exchanged. Finally, Amazon is such an easy way to shop! For your convenience, we have listed many favorite products that can be found on Amazon. There is a range of price levels represented, usually beginning with the more expensive options. Of course, price often reflects quality, but sometimes, such as shoes for children who are growing a mile a minute, a lesser quality product os just fine! Like many sports, a helmet is a simple thing that can prevent a lot of headaches (literally!). While it may seem silly, a bicycle helmet won't cut the mustard; it's gotta be ASTM certified for horseback riding. 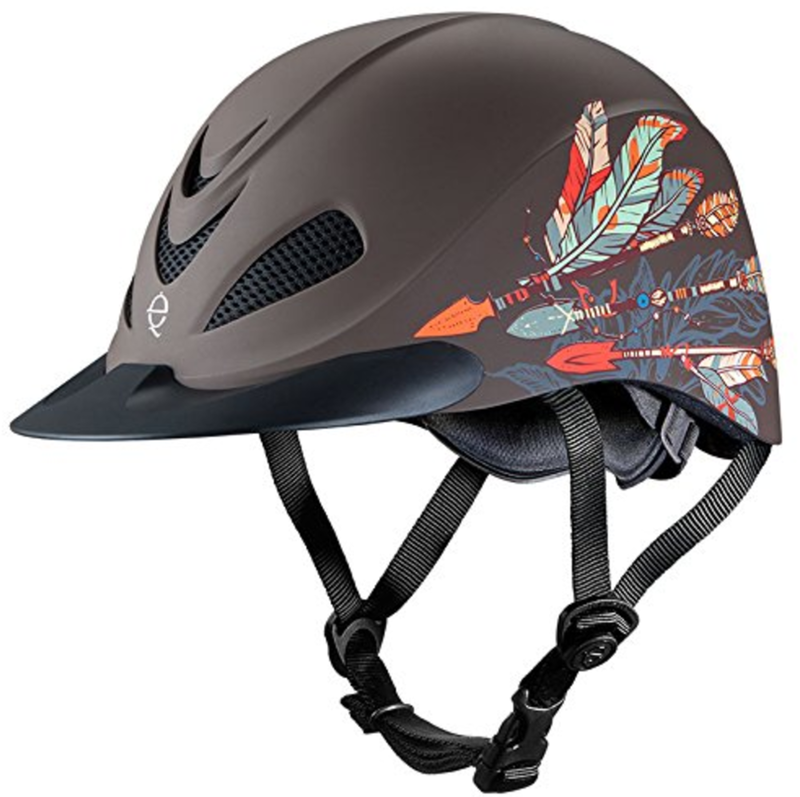 Horse riding helmets come in a variety of colors, styles, and fits. It's kind of nice to try one on before you buy to make sure you like the fit. 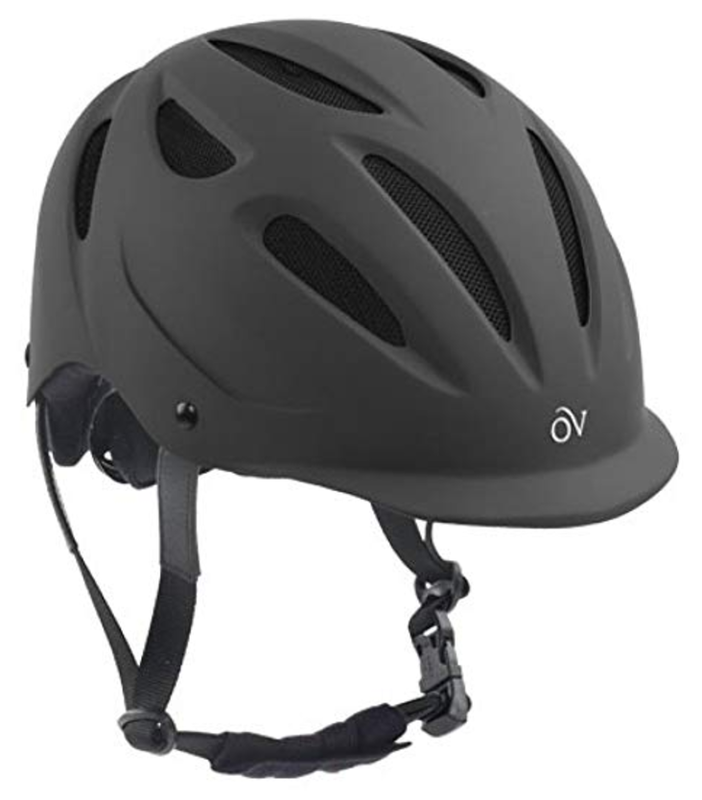 We have a few options to try at the barn, but the Ovations Deluxe Schooler is one of our favorites, as it generally has a low profile and comes in a variety of colors and sizes. 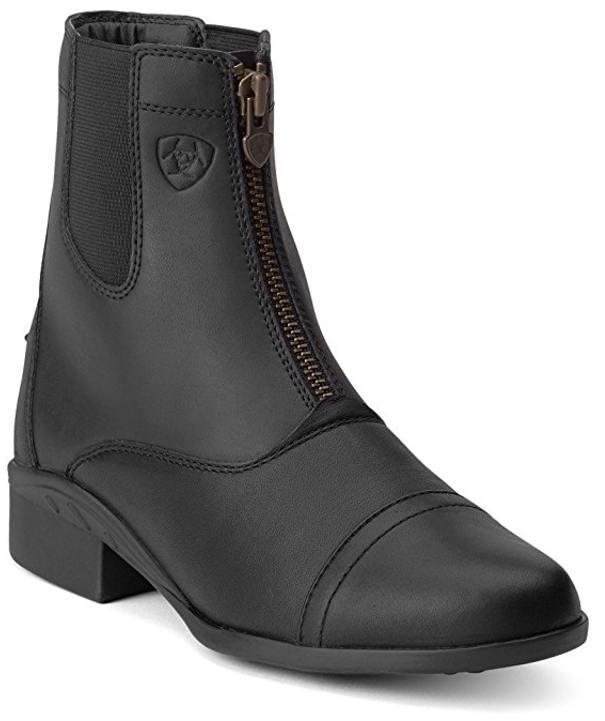 Next to helmets, riding boots are one of the best safety features a rider can own. A 1" heel helps to keep the foot from sliding through the stirrup, the smooth sole slides easily in the stirrup, and the solid toe helps protect tender toes from misplaced horse feet. Below is a selection of paddock style boots, English and Western. In our Winter Wear section below, we have listed some cold weather rated boots as well. English riders will usually need half chaps as well to protect their legs from getting pinched by the stirrup leathers (see some selections below). Or, for more proper wear for rated shows, English riders will often purchase tall boots, instead of half chaps and paddock boots. We haven't listed any tall boots, as they are not often worn at our barn and usually either quite expensive or made of rubber (like a rain boot) and quite uncomfortable. While half chaps are not mandatory, they protect the English riders legs and pants from getting pinched between stirrup leathers. While many of us enjoy riding in a nice pair of jeans (Western riders might not be caught dead in anything but! ), riding breeches/tights often are less restrictive and quite a bit more "proper" for English riders, in particular. If you're really getting into the equestrian thing, then you'll want to accessorize! Gloves and tall socks are pretty useful accessories – and can be fun too! In Tennessee, we get cold and muddy during the winter – but that doesn't stop us from riding! However, it is much more pleasant to ride when you're warm, and instructors find it a bit frustrating when students can't concentrate because they're inappropriately dressed for the weather. Toes and fingers are usually the first to freeze, so a good winter riding shoe and glove are essential. We love PVC boots (not rubber boots) such as Muck Boots (though be careful of soles that are too grippy), and of course there are some fabulous higher-dollar paddock shoes. Long-john, good coats, and/or winter overpants are also a great investment for dedicated riders. "Clothing is the first step to building a character"